The T-34 Model 1940 and Model 1941 were a big shock for the Germans, but they had a number of serious problems from the Soviet point of view. They required a lot of scarce materials such as rubber, many assemblies were welded, and the turret was extremely cramped. As a result, the tank underwent some redesign and along with the new 5-speed transmission added during the Model 1941 production run they changed the things which were wrong. The rubber tire road wheels were replaced with cast steel ones having a small rubber bushing in the center, but these were quickly found to be too hard on both the tank and the crew. While official orders were to use nothing but steel road wheels, most factories quickly created a new cast steel version with a rubber tire. These were used on the first and fifth road wheel stations on both sides, and eventually – as US supplies of synthetic rubber began to make up the difference – the tanks gradually shifted back to rubber tires on all wheels. Cast turrets were used in both the Model 1940 and Model 1941, but a new, more efficient and larger turret was created for the T-34, and even though there were several variations, all were cast. (The pressed steel turret from Chelyabinsk was a different approach to producing turrets of this design.) The Germans called them "Mickeymaus" turrets as with the hatches open they looked like mouse ears; the Soviets dubbed it the "Gayka" or "hex nut" due to its hexagonal shape. The new tank, generally referred to as the "Model 1942" by most Russian authors, did not really get an official title but was referred to as the T-34, just like its predecessors. 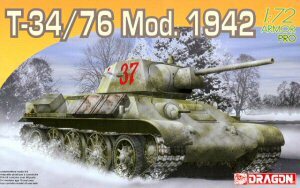 The Germans called it the T-34/76D, a later model with commander's cupola the T-34/76E and the Chelyabinsk tanks the T-34/76F. All were four man tanks; the T-34 did not get a formal fifth crew member until the T-34-85 series tanks came out in late 1943. DML has followed on the heels of their very nice T-34 Model 1941 with this kit, and it comes with many nice touches. One of the surprising ones is that it comes with nearly all of the accessories found in the Tamiya "Model 1943" 1/35 kit of the same vehicle; handrails, tools, boxes, unditching logs, and rear auxiliary fuel tanks. It also possesses "slide molded" double wheel sets for the running gear with the two wheel pairs made as a single part. It provides the correct four rubber tired and six steel wheel pairs. The gun barrel is molded with a hollow tip, and a basic interior for the turret is provided. The engine deck comes with a choice of air exhaust grilles – solid or a frame with an etched metal insert. Somehow this is one of the nicer features of the DML kits, as none of the other manufacturers seem to think this far ahead. Not all modelers are fans of etched metal, and giving the modeler the choice in one box is a truly great idea. The model comes with a great – and for once useful! – decal sheet and a choice of six different finishing options: 264th Tank Brigade, 4th Guards Tank Corps, an unidentified vehicle at Kharkov, two options (summer or winter) from the 30th Guards Tank Brigade, and one captured tank from the SS division "Das Reich". Overall this is a great kit and should prove very popular.